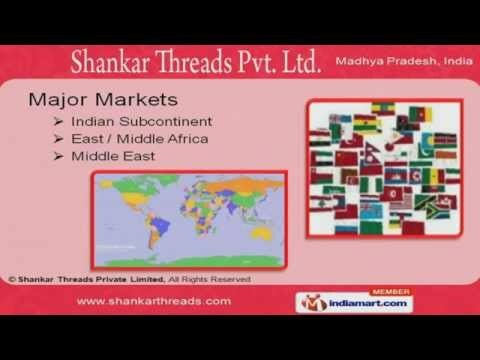 Welcome to Shankar Threads Private Limited Manufacturer & Wholesaler of Threads & Yarns The company was incorporated in the year 1987 at Indore. Our products are Applicable in Carpet, Umbrella & other industries. Customized range of products, Timely delivery schedule, Market leading prices & Excellent logistic support have helped us to gain present repute in the industry. Indian Subcontinent, Africa & Middle East are some of our major markets. Our product list includes Industrial Yarns, Handicraft, Sewing & Industrial Threads. We offer high quality threads for Umbrella, Tarpaulin, Notebook, Lace & Zari. Our exclusive range of handicraft threads include Glace & Kite threads. Leather, Saddlery, Sports Goods & Bag Closing Threads are some of our premium grade sewing threads. Our carpet yarns are widely appreciated in the market for their outstanding quality.